Beornwyn of Lythe, the young daughter of an ealdorman, spurns marriage and chooses to remain a virgin dedicated to Christ. When she is found murdered in the chapel where she kept her nightly vigils, the butterflies resting on her corpse are seen to be a sign from God that she should receive sainthood. It is not long before St Beornwyn comes to be regarded as the patron saint of those suffering from disease, and many are drawn on pilgrimage to her shrines. 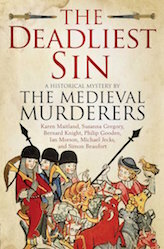 But from a priory in Wales to the Greek island of Sifnos to the final resting place of Beornwyn’s bones in Herefordshire, far from bringing healing to sick pilgrims, it seems that St Beornwyn’s remains leave a trail of misery, maladies and murder in their wake. So when a famous poet pens a new tale of St Beornwyn, it is no wonder that he questions whether she was as holy as has always been believed . . . and soon, rumours begin to spread from Nottinghamshire that threaten to ruin the reputation of the saint. Could the saintly deeds attributed to her have been carried out by someone else? 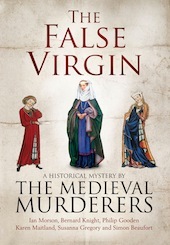 What if the virgin was not all she seemed? Will the truth about St Beornwyn ever be discovered, or will her story remain forever wrapped in legend? Prologue: In which Karen Maitland tells how a grisly discovery in St Oswald’s Church in Lythe, near Whitby, turns a Saxon princess into a venerated saint. Act One: In which Susanna Gregory and Simon Beaufort tell how Beornwyn’s hand is stolen from Lythe by two unscrupulous thieves in the year 1200, and taken to drought-stricken Carmarthen. A violent thunderstorm follows . . . and so does murder. Act Two: In which Nick Zuliani and his grand-daughter Katie travel to a Greek island on a mission for the Doge of Venice, and encounter murder and the cult of the virgin saint Beornwyn. Act Three: In which Philip Gooden describes how John of Gaunt’s Thames-side place is shaken by a murder linked to a poem about St Beornwyn, composed by Geoffrey Chaucer, Gaunt’s protégé. Act Four: In which Bernard Knight tells how St Beornwyn led to a murder enquiry in 1405 in an obscure priory near the Malverns, which was resolved by Owain Glyndwr. Act Five: In which Karen Maitland relates how a Master of the Butcher’s Guild is determined to conceal the guild’s valuable reliquary of St Beornwyn, to prevent Thomas Cromwell’s most feared enforcer from destroying it. But when Cromwell’s enforcer arrives in Sherwood Forest, murder follows in his shadow and threatens to destroy more than the precious relic. Epilogue: In which Philip Gooden tells of an encounter between a dealer in saints’ relics and a Russian oligarch.